Scheduling tasks in advance is a perfect way to manage things for multi-taskers. This is especially true in case of people who are busy managing some kind of business. While being busy is a good sign, using a powerful software to schedule tasks can help save time and stress. That’s when you need the best task scheduler software that does not just schedule tasks, but also helps tracks manage appointments and clients. A task scheduler is linked to Windows from where it can manage the startup files. This in turn, helps you manage the opening of the Windows system, shutting down, running programs, permissions for applications, etc. It can also insert multiple tasks to its lists and send notifications before running any task. While the built-in Task manager of the Windows system is able to schedule a few tasks, its confined features enables it to only just start and end the process. The task schedulers on the contrary, come equipped with a lot of functionalities. While these programs can send reminders to you, it can also be scheduled to arranged to perform regular scans, automatically. So, let’s see the best task schedulers in the business, without much ado. If you want to automate your regular tasks, Z-Cron can be your best bet. This software helps automate multiple processes like executing jobs/tasks on your computer on a pre-defined time. It’s the basic organization period when you can schedule and automate the software. Apart from the time-based launch of applications, the software includes primary tools that help relax the system administration for automation and scheduling. It helps you start and end programs with *.exe, *.com, *.bat formats under the Windows time-generated which is the same as the Unix Cron. Another free and one of the best task schedulers in the category, Freebyte Task Scheduler allows you to schedule tasks for a pre-set time. It’s a compact program that requires no installation, saving you the time you would other spend on the setting up the processes. Among its significant features are the option to start other applications automatically, at regular periods, and at pre-set times. Adding multiple programs, removing programs or configuring tasks based on your requirements, are also some of its other major features. It also runs perfectly well and in sync with backup programs like disk fragmenters, virus scanners, and different other regularly set functions. For installation, you simply need to copy the file to be run in to your preferred directory, without the need of any specific dll. What’s more? While you can minimize it on the taskbar and still use it, it can also run the task earlier than scheduled. Schedule Manager is one of the best task schedulers in the list that allows you to create your daily regime while carrying out different tasks. This includes tasks like shutting down, setting off the alarm, and download files at a certain time, automatically. The software offers enough freedom to you in terms of specific time that can be based on per hour, per day, or per week. It can also perform other critical tasks like hibernate, getting screenshots, downloads, and more. It uses sounds to attract attention with integrated sounds and options. Moreover, you can also set various tasks to be synchronized using the software. Best of all, each task comes with wide rage of options. 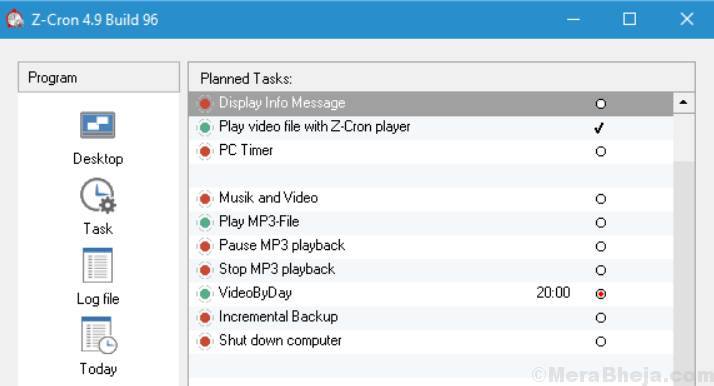 Advanced Task scheduler is another great task scheduler that extremely reliable and easy to configure. It’s a perfect task scheduler that automates the usual repeated tasks. 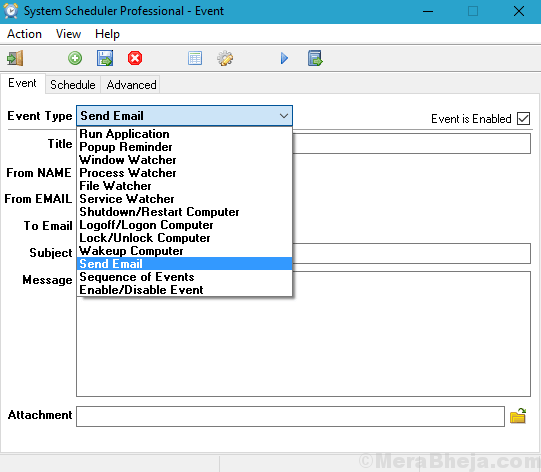 This multi-functional scheduler enables you to start programs, batch files, scripts, plays sounds, send email messages, opens web pages, performs FTP, and much more. The extensive list of scheduling options enables the scheduled tasks to run automatically, several times. (once, per second, per minute, per hour, per day, per week, per month, and even per year) in a fixed time period once the system is started. Not just that, it can also automate several different regular tasks along with popup alerts that work as constant reminder. Automatic shutdown, ceasing processes at a certain hour to prevent programs to start/stop automatically, automatic launch and shut down of dial-up connections, etc. are some of its other major features. If you are looking for a free software then System Scheduler can be the solution. It helps you schedule tasks along with other actions like sunning applications, sending popup alerts, etc. It comes equipped with different scheduling options and the flexibility to dispatch keypresses to applications. The advanced version on the other hand comes with added features, for instance, rebooting local and remote systems, sending emails, and so on. While it allows you to set reminders, tasks, and other events to be executed at regular intervals (once, per second, per minute, per hour, per day, per week, per month, and even per year), you can also snooze the popup alerts when deemed necessary. As a bonus – it comes with a feature called Window Watcher that tracks the presence of a specific window before dispatching keypresses or dispatching a close signal to the window to stop the running applications. Price: free version available; upgrade starts from $30. 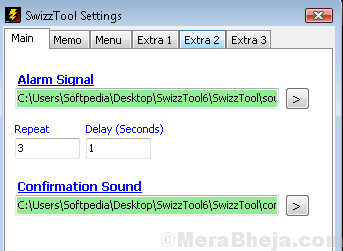 SwizzTool comes loaded with features that automates the processes like setting reminders, making notes, or starting a program. The best part about this software is that it can be deployed on both your home and work computers straight from the thumb drive, and saves you the time and effort that you would otherwise put on the setup process. While it’s known for its flexibility, it also maintains the system registries as it is. This helps keeps the PC in use, unaffected. The software stays calm on the system tray, ready to be run anytime. 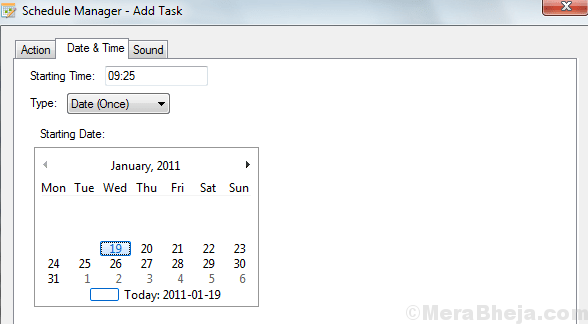 Here you can access all the tasks such as, alarms, memos, clipboard manager, hotkeys, and more. All these tasks are completely customizable. You simply need to select the task from the specific drop-down menu where you get the choices like, lock the PC, open a file, run script, add to clipboard, etc. In addition, you can also set reminders with the options to display a message, run a task, play sounds, and more. 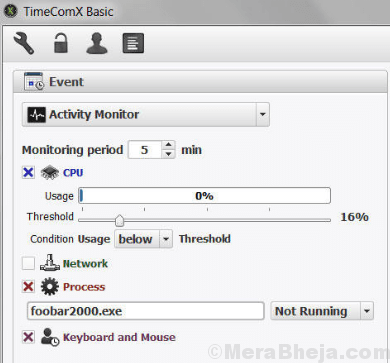 TimeComX Basic is a step ahead in comparison with its competitors with its ability to manage power. It offers a lot more in comparison apart from just scheduling the reboot, log off, or shut down processes. It features an attractive interface which is pretty to easy to use. All you need to do is to select the desired task, mention the time for it to be performed, and there you go! It can also lock the interface as a security measure. Scheduling a process to end at a specific time, playing an audio file, executing a file to run or open, getting screenshots prior to the original task, or alerting you with a countdown enabling you to reject the task execution, are some of its other major features. This free task scheduler, Task Till Dawn, helps your ongoing and stressful tasks to be automated to help you focus on your primary work. The integrated image editor enables you to create your processes from a wide range of ready-made actions. These actions can be then deployed on a schedule or started by specific events. Majority of these actions work on all major platforms including Mac and Windows. 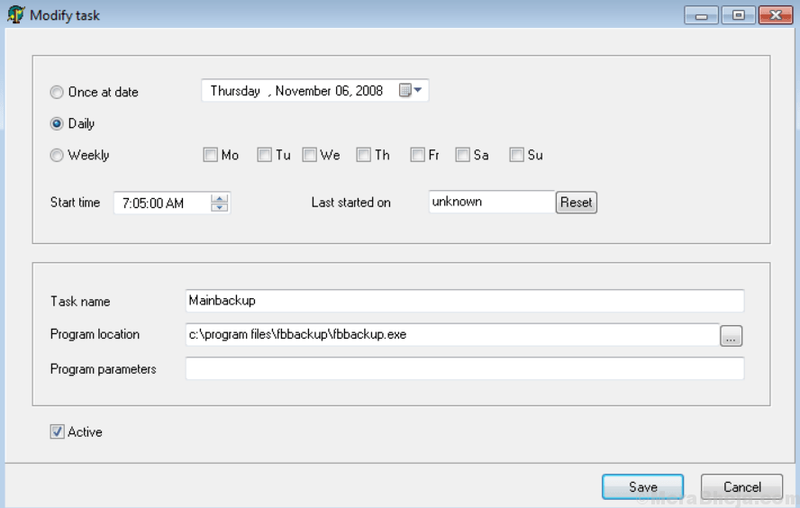 While it allows you automate a backup for your newly created crucial files every week, it can also connect the desired network drives when the computer is started, automatically. Moreover, it also lets you create a task to print files the moment they are stored in a certain folder. It also automates the image files copying, and more. Its native support for import and export of tasks, makes the exchange process within different systems, much easier. If you are looking for something small and easy to handle, there could be no better option than the Solway’s Task Scheduler. This easy to use software is perfect for scheduling tasks. It helps you starts other programs on the system automatically, or even play music, run batch files, at regular intervals or at pre-set times, and more. It syncs well with a backup software, virus scanners, disk fragmenters, and other similar tools. Moreover, it allows you to insert several different programs, lets you analyse the possibility of operating it on Windows launch, and even can be run while it’s minimized on the tray. Process-Timer is a compact program that does basic jobs like scheduling processes. It deploys a countdown timer to start or end a user-defined process. Being a compact program, it does not leave any footprints in the Windows Registry. This can be copied on the USB flash drive or other external storages and can be carried whenever required to start or end a process at a pre-defined time. Best of all, it does not even need to be installed or set-up as it runs out of the box. It features a simple user interface that includes only a few customizable settings that can be tries and tested. Everything is straightforward and clear, helping even the beginners to play with it, easily. It allows you to select the desired action that you want to start such as, running or quitting a process, pick a customized workflow with the help of the integrated browse button, along with the selected date and time. 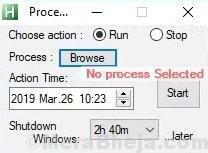 In addition, you can also shut down the PC whenever the task ends and delays the closing operation by choosing the multiple pre-defined times. Scheduling a task at a set time not just saves you a lot of time, it also eases the entire process of multi-tasking. Downloading any of these best task schedulers will make sure that you manage your time efficiently as you automate the mundane process. So, download one today and get in control.